There are still spots open for both days of the Conference! We’re getting the faculty in place and can’t wait to share once they are all confirmed. Registrations are now closed for the 2018 Musical Theatre Conference For Students. Thank you to all who registered, we’ll see you at beautiful Kildonan Park! Due to a recent withdrawl, 40 spots have opened up for Thursday, May 24! We will not be adding an additional day to the conference this year. Thursday, May 24th of the Musical Theatre Conference is now SOLD OUT! We have added a ‘wait list’ option to the registration form. On Monday March 26th, 2018 we will begin releasing any unpaid spots being held on reserve to those on the waiting list. Additionally, due to this unprecedented response (last year we were not sold out until April), we are now looking into the feasibility of adding an extra day to the conference. This potential additional day is earmarked for Tuesday May 22nd, but this is not confirmed at this time. We will keep you posted! There are only 40 spots remaining for the first day of the Conference – Wednesday, May 23rd. For those who have not signed up and were planning to attend, please sign up or join the waiting list today! Rainbow Stage will once again be hosting our annual Musical Theatre Conference for Students! 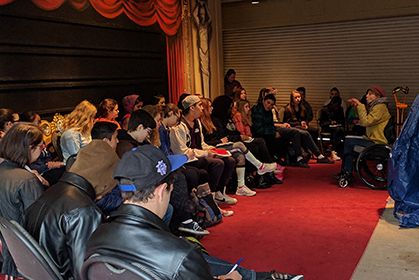 Geared toward middle and high school aged students, attendees choose and participate in four of eight unique sessions that cover many fundamental aspects of “putting on a show”. 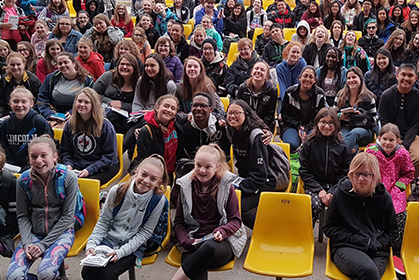 Attending students also receive a voucher for a free ticket to our 2019 August summer production – to be announced on January 21, 2019! The first three years of the conference introduced students to a multitude of departments that all work together to create a musical. 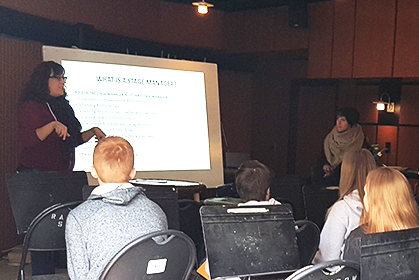 From producing and stage management, to production and performance, participants were given insights and resources pertaining to each department’s role, professional process, tricks of the trade and career opportunities. In a world where the crab who tries to escape the bucket is pulled back down by the other crabs and the tallest poppy is cut off by the farmer to create a uniform field, the fear of standing out can be paralyzing. Our aim for this year’s conference is to introduce students to concepts and exercises that will help them face that fear of being distinct and by conquering it, release their true and unique creative spirit. You’ve got the notes. You’ve memorized the lyrics. And you’ve got the rhythms and timings nailed to floor. But that’s just were the work begins for a musical theatre artist who wants to sing a song with impact. Through a fun combination of text analysis, vocal technique and experimentation, learn how to approach singing from an acting stand point first. It’s time to get out of your head and let the character sing! In this acting session students will learn how to unleash their true creative impulses. Drawing from the basic principles of Improvisation, Clown and Commedia Dell’ Arte participants will experience the meaning of ‘beat your brain’, ‘right, righter, rightest’ and ‘never say no’ in a silly and safe atmosphere. Become a better actor by learning how to listen harder, react quicker and start letting go of trying to control the character from the mind. Only you can play the character your way. Ready, set, GO! 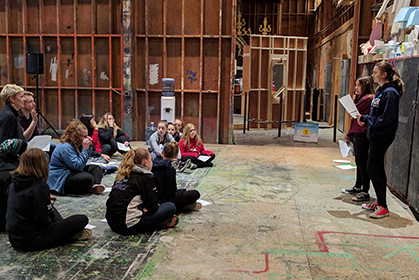 In this session students will learn and apply the basic tools that designers use to create dynamic and effective stage environments. Whether designing for sets, lights, or wardrobe, the same vocabulary is often used: Color, Shape, Line and Direction. 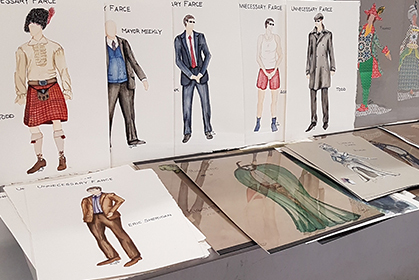 In this session students will be put into small design teams in order to create a miniature model (or prelim design) for a musical that incorporates these four main design elements and put it under a miniature lighting station at the end to see how it all turned out! How to make smart, simple, crafty decisions when prop-making is always required. What do you do if you can’t find or borrow an item? How do you make something on a shoe string budget and there is no time? In this session students will be put into prop making teams and given a prop challenge to make. 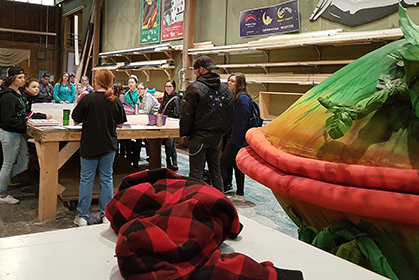 With the guidance and support of the session’s instructors and using the materials provided, students will learn tricks of the trade, basic do’s and don’ts, and tried –and-true methods for effective and affordable prop-making. Being thrifty and crafty is not only required in theatre, but in this day and age – it’s a life requirement! How to work with your hair in a musical is an art form unto itself. Whether the story takes place in a certain time period or draws on certain character archetypes, hair is a crucial element that helps transport the audience and suspend disbelief. In this session students will partner up to learn about different tools, techniques and tricks-of-the-trade through a fun exercise that explores the multitude of ways hair can help draw out character from the actor and create that perfect ‘look’ for a show. How to work with your make-up in a musical is an art form unto itself. Whether the story takes place in a certain time period, has distinct ages or draws on certain character archetypes, make-up is a crucial element that helps transport the audience and suspend disbelief. 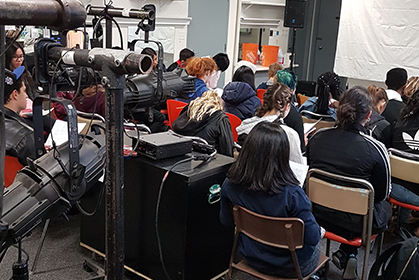 In this session students will partner up to learn about different tools, techniques and tricks-of-the-trade through a fun exercise that explores the multitude of ways make-up can help draw out character from the actor and create that perfect ‘look’ for a show. You’ve got the formations. You’ve got the rhythms and timings. And you’ve got the moves nailed to floor! But that’s just were the work begins for a musical theatre artist who wants to perform choreography with impact. Through a fun combination of text analysis, dance technique and experimentation, learn how to approach choreography from an acting stand point first. It’s time to get out of your head and let the character dance! The best songs are the ones that write themselves. Using everything from the voice and instruments to buckets and other common items that can make noise, students will explore rhythm, melody and lyric through creative exercises. In this session you will be a part of composing the greatest piece of music in history…potentially. At the very least, you’ll be a part of jamming out something truly unique and never heard before on our planet. It’s time to let out the eccentric musician inside you! You will receive an email from Jeffrey Kohut, acknowledging receipt of your registration form and invoice (if required). Your spot(s) will be reserved at this time. Directions will then be given to you on how to submit your payment. Step Three Upon confirmation of payment, you will notified you that your registration is complete and your spot(s) are confirmed. Sending in your registration form does not guarantee your spot(s) at the conference. We will reserve your spot(s) until May 3, 2019. If we have not received payment by this date, your spot(s) will be made available to those on the waiting list. 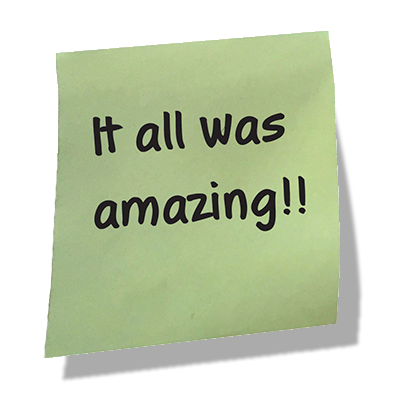 Our 2017 and 2018 conference sold out well in advance. To guarantee your spot(s), send in your registration form and payment at your earliest convenience.